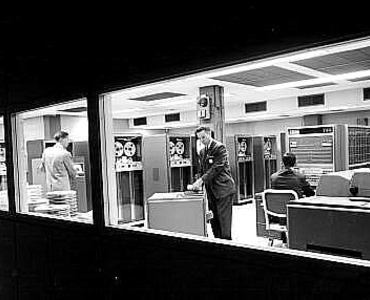 Announced January 2, 1957 and withdrawn April 7, 1960 The IBM 709 Data Processing System was a large, general purpose digital computer designed to solve complex problems in areas of commercial and scientific interest. Large volume and extremely rapid input-output operation were major features of this system. The 709 was highly flexible and could be expanded by the addition of storage and input-output units. This system operated at high speed and offered maximum flexibility with a minimum of programming effort. IBM 709 Central Processing Unit for coordination of all 709 activity. IBM 711 Card Reader for input of punched card information. IBM 716 Printer for output of printed reports. IBM 721 Card Punch for output of punched cards. IBM 729 Magnetic Tape Unit and IBM 755 Tape Control for high speed storage and tape powering control. IBM 733 Magnetic Drum Storage for large capacity storage. IBM 737 Magnetic Core Storage for primary storage media. IBM 738 Magnetic Core Storage for large capacity storage. IBM 740 CRT Recorder and IBM 780 CRT Display for filmed recording and display of information. IBM 766 Data Synchronizer for control of multiple input-output units. The IBM 709 CPU served as a control for the 709 Data Processing System. This component synchronized and coordinated all 709 activity and directed problems to their solutions. The CPU incorporated an Operator's Panel which provided manual intervention to begin, interrupt or end stored program control. Interpreted and executed all instructions at high speed. Performed both fixed and floating-point arithmetic operations. Fixed point operations executed at a rate of 42,000 per second. Made comparisons, arrived at logical conclusions, and acted accordingly. Routed all results to the proper storage location or to an output unit. Three index registers provided automatic counting and address modification. Input from magnetic tape and punched cards. Output to magnetic tape, punched cards, printed reports, film or visual display unit. Magnetic drum provided auxiliary storage capacity. Operator's panel permitted complete communication between system and operator. Provides simultaneous and independent transmission of information between multiple input and output units and magnetic core memory.